Remy and I started a basic, beginning dog agility class, and I’m going to share the criticism Remy’s trainers gave us. These actually have very little to do with agility, but they’re helpful for communication and training in general. I thought many of you would be interested in hearing these ideas and that you’d be able to benefit as well. 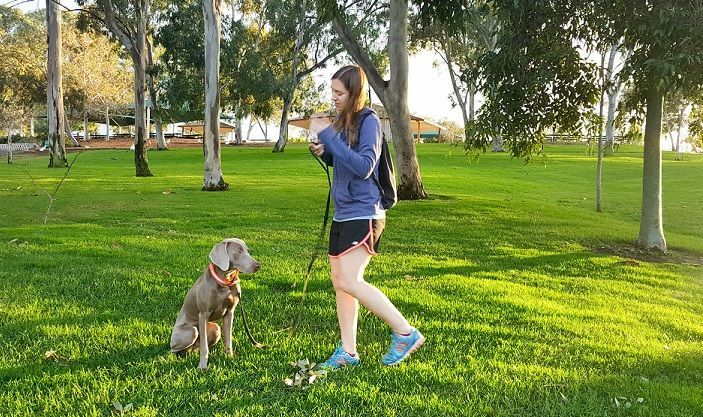 This just goes to show how helpful it can be to have a trainer observe you and your dog or even for you to video record yourself working with your dog. It can be eye opening! Notice these six items have very little to do with agility obstacles and more about communication! You could apply these to almost any training you do with your dog. Let me know if any of these apply to you and your dog no matter what kind of dog “sports” or training you do – nosework, obedience, hiking, flyball, rally, hunting, etc. 1. Impulse control in agility and beyond. 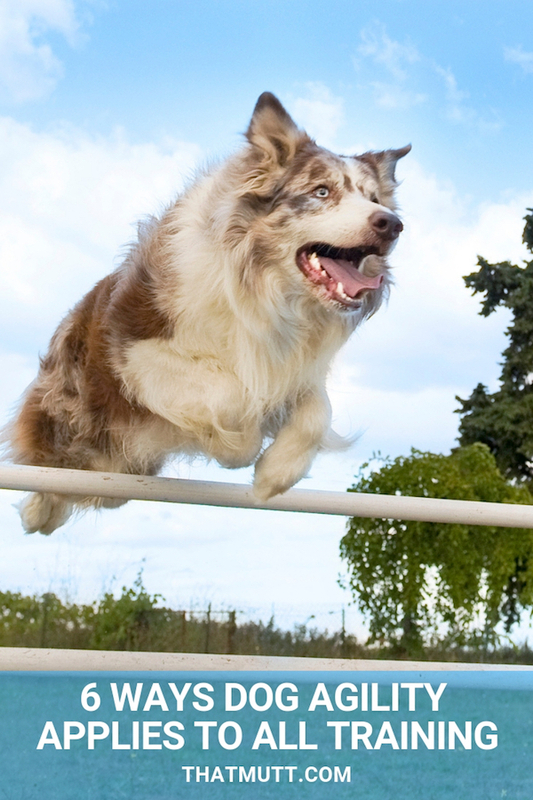 Impulse control is important for all dogs, not just agility dogs. Remy’s lack of self-control is obvious. He jumps on people, snatches treats and can be quite the menace! In agility, this became instantly obvious to our trainers because Remy was fixated on my hands and biting me obsessively to take the treats. I’m so used to this behavior from him that it doesn’t even bother me, but the trainers quickly reminded me to get this under control. The easiest way to work on impulse control with Remy is to hold out a treat in my fist and to not give it up until he stops biting my hand AND moves away. He catches on extremely quickly to this concept but it’s something he needs work on regularly so he learns he can’t get away with this. 2. Too dependent on treats during training. Again, this applies to all types of training and goes beyond agility. Use the food to reward your dog for structured work, not to raise his excitement off the charts! In agility practice, we were doing an exercise where we were teaching our dogs to run in a simple Figure-8 pattern around two barrels off leash. I was dependent on holding treats in my hand so I could “lure” Remy where I needed him to go. He’s a treat magnet, after all! One trainer immediately pointed out, “Stop holding treats! No treats in your hand!” The reason for this was because my dog was obsessing over the food, biting my hands and not thinking through the problem. Instead, she told me to ask him to do the pattern by guiding him with no treats in my hands. Then, after he did the exercise correctly, tell him “Yes!” and reward with a treat from my treat pouch. Literally the very first time I did this without treats in my hand, Remy performed it perfectly. The difference was night and day, and it showed my dog is smart and capable if I make him work for it. It also showed me that I’ve been letting him get away with a lot of immaturity! I’ve written before about how I’ve felt frustrated by “all positive” trainers because the constant shower of treats and praise gets my hyper dog even more hyped up! You have to find the right balance that works for your unique dog. 3. The dog’s lack of “back end” awareness. 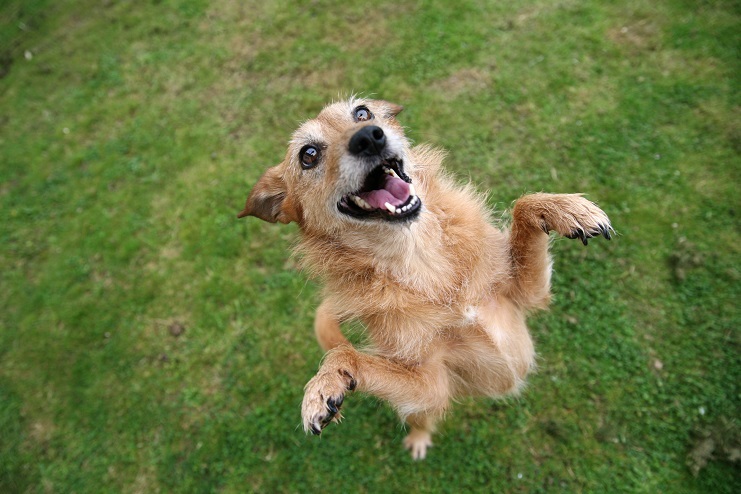 In agility, you hear this a lot – dogs meed to be “aware” of their bodies and that means their back legs too. 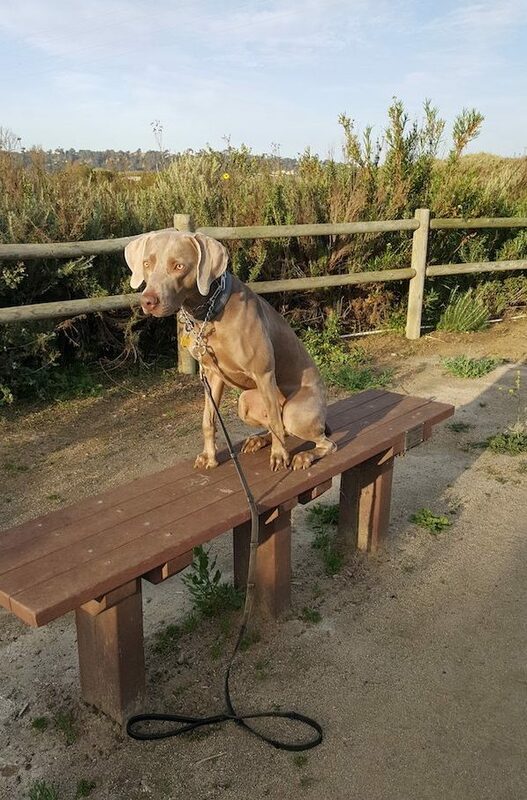 For example, when Remy was asked to walk across a long, narrow board to get the treat on the opposite end, his back legs went flying off the board! He simply had no concept of keeping them coordinated. His trainers had some suggestions for us such as asking him to stand on small, flat obstacles like plastic lids and boxes. I reward him when all four paws are on the “target” and then we can work with smaller and smaller “targets.” I can also teach him to put just the front paws on the target or just the back paws (much more challenging!). Remy does know the command “back up” which will be extremely useful for working on his awareness. For example, I can ask him to “back up” when we’re standing at the bottom of the stairs so only his back legs will be on the bottom step. 4. Too dependent on dog training collars. We can all be too dependent on whatever training tools we use. None of the agility trainers pointed this out, but I realized it on my own. Since agility is done mostly off leash, we are encouraged not to use training collars like choke collars or Gentle Leaders so I brought Remy on his flat collar. Remy is strong and I almost always use a no-pull harness or a prong collar with him. Judge away. It’s what I do to keep my dog safe and controlled! In agility, I have had to learn to keep my dog’s attention on me WITHOUT depending on any training collar, and that is a real challenge. We’ve already been doing off-leash exercises in agility, and Remy is the type of dog to get fixated on sniffing some random spot on the ground or eating the dirt (seriously!). So, I have to be more interesting than all of these amazing smells! To get Remy’s attention, I use high-valued treats in a structured way (not depending on them either!) and I use my voice and movement to be more interesting! To get more practice with this, I’m going to take him outside on a long 30-foot leash and see if I can keep his focus on me by using only food, praise and movement. No training collar and no stepping on the leash unless it’s an emergency. 5. Same command – different context in agility vs. obedience. 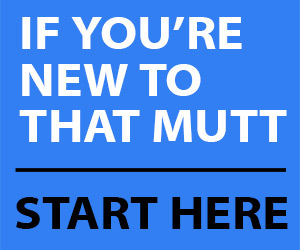 Our teachers pointed out that dogs can totally understand that a command has different meanings in different contexts. Sure, I could choose two different commands for the two different contexts but our trainers suggested this was totally unnecessary. Your dog would understand the difference, they said, and I think they’re totally right. So, instead of complicating things by using two different commands, I’m going to stick with “come” and it will have slightly different meanings depending on context. 6. Stand up straight in agility and look ahead! OK, this one really is pretty agility specific. Even though I have a big dog, I’m constantly bent over at his level and apparently I stare at him! And I didn’t even realize I was doing this! People who have small or short dogs are more likely to be bent over when trying to communicate with their dogs and our instructors told all of us we should work on standing up straight and focusing on looking up ahead to the next obstacle. Our dogs will learn to follow our lead and to head where we’re looking. If we’re bent over and staring at them all the time, we’re actually holding them back since we’re not leading them where we want them to go. OK, notice those six items had very little to do with agility! Let me know if any of these apply to you and your dog no matter what kind of dog “sports” or training you do – nosework, obedience, hiking, flyball, rally, hunting, etc. Also, if you’ve learned about something you need to change with your training, let me know what that is! Hi, Cocoa’s and my trainers have had us working on this since day one. I didn’t know this until I read this article. Leave it,wait and stay, are examples of impulse control. Because Cocoa is a wiggle but she has had to learn where her back legs are and walks balancebeams like a model. The best tool I have been given by our trainers is a touch stick. It is used like a treat. In tricks class Cocoa learned to follow the stick intead of the treak that she got when the trick was done. Oh good to hear this, makes sense. 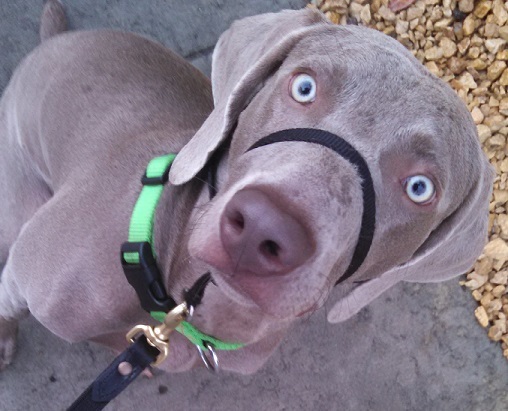 This is a great post… and another reminder I owe you a post on training without treats. Our trainer’s stance was partially what you’ve talked about here. The dog may be fixated on the treat, not the behaviour or you. She was also big on posture and body language and using our peripheral vision. 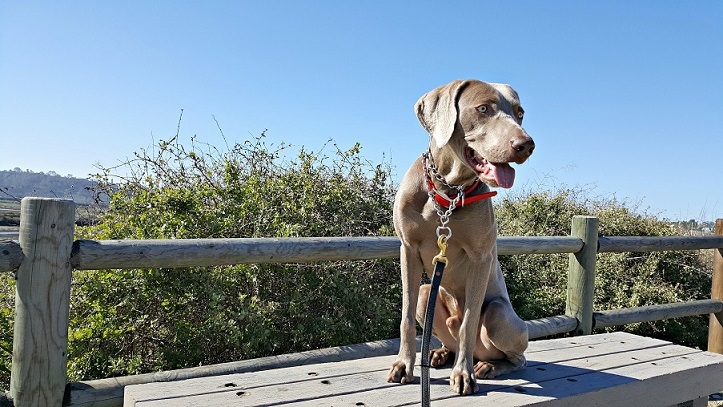 She said that walking with confidence–head up, shoulders back, eyes ahead, even swinging our arms emphatically (but not erratically)–helped our dogs to be calm and better behaved, and I noticed a difference with Bax. Yes, that all makes sense too. I like to use treats but conservatively or when working on something new or difficult. But it was very eye opening for me how Remy performed perfectly once treats were not in my hand. He simply could not focus if I had them in my hands. He knew exactly what to do once that distraction was removed. Silly dog. I started training in tracking without treats (like actual K9s, we used a tug or ball at the end instead). This was interesting because my dog is very food driven and not at all toy driven. So the work she was doing in tracking was purely for the sake of tracking. There was effectively no other reward. My new instructor is fine with treats, so we use them at the end. Both of my tracking instructors and my Nosework instructor have advised having separate commands for each sport. They have also suggested separate gear for each sport. It’s a context thing. My dog knows that when she’s in harness and I tell her to track, we’re tracking; when she’s in her martingale and I tell her to go find, we’re doing Nosework and she should be hunting for odor. It doesn’t confuse her, and she knows so many words anyway that an extra command doesn’t matter. Back end awareness: This has been really important for her in tight search areas. I joke that she moves through small spaces like two people dressed as a horse, but she DOES. The graceful extension you see in the show ring just doesn’t happen in a tight area. It’s taken her some practice to effectively negotiate those small spaces to source hides. I think most important for us has been building our bond and our communication so that when we get into a trial situation and I’m running on adrenaline, I’m able to read her body language and discern what she’s telling me. She’s a subtle dog, and it took me a long time to learn her. All of that studying of her movements and expressions pays off when we enter a search area and I’m able to pick up on what she’s telling me, and to anticipate her movements and get out of her way. Navigating a search area can be a dance, and in the moment, you have to be able to read your partner without thinking about it too hard. Congrats on your big trial last weekend, by the way! Thank you for your comment. It’s all very interesting to me. Thank you! I’m really hoping they were able to get video of our interior search; I’ll share with you if they were. I thought her work was really pretty, but I also had to watch her closely and be ready to move out of her way because there were two searches in tight areas, one with multiple hides. I acquired a very damaged golden girl at 2 years old. Spent 3 years with a good trainer for fear and aggression. We started obedience and rally and did well. Then we found agility! Woohoo! She blossomed! I wasn’t going to compete she was still to aggressive. We started to compete at 7 years old. At 11 1/2 we got our first NATCH a year later at 12 1/2 she got her second! Don’t give up! So many good ideas here! Lambeau still has issues with impulse control, so I need to really start working more consistently with that. And back end awareness- heck, half the time he doesn’t have a clue where *any* of his body is! LOL I also am very dependent on his harness. He’s strong and the flat buckle isn’t the best (for me more than him) because he can pull me off my feet if he gets too excited. But, of course, that also goes back to impulse control, so it is all tied together, isn’t it? I’m going to start putting some of your trainers’ suggestions into practice with Lambeau. Thank you! Love this! Me and my dog learned more in our agility class than we ever did in our obedience class. I think everyone should do it. Not quite sure I agree with point 5 though. I was told never to mix commands in agility. You wouldn’t in other training. For example the “leave it” command. We teach our dogs that leave it means don’t touch ever. And wait means wait and then you get it. Im not denying that dogs understand that “come” can mean two different things but I just think you are making things more confusing for your dog by doing that. I personally used “follow” in agility and “come” at home. Yeah, I hear ya on using the same word for different meanings. I’m not sure what I’ll do or what’s best. Our dog definitely has issues impulse control sometimes. Not in all situations just in certain situations. It’s something we need to be more consistent with – cause she falls back into old habits easily. I found the back end awareness thing interesting. I’m guessing Ruby would not have much back end awareness either. I think I’ll experiment that with her this weekend. 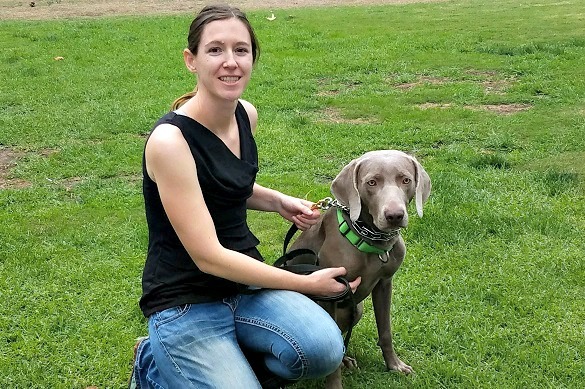 We started dog agility a couple years ago with our pup Ginger to help her gain confidence. What we didn’t realize was that we were about to learn even more than she was! Everything you mentioned resonated with me. My daughter is now taking the agility classes with Ginger and she is learning how her actions and body movements play a huge role how Ginger reacts and learns. (I’m so sorry if this posts twice… I got an error on my first try!) Back-end awareness is something Cooper and I worked on a LOT when we were taking agility classes. After we moved, we never started back up again, and we need to at least do some at-home work on that. I marked the video recommendation you shared to watch later! It’s something I wish we had worked on more with Emmett before his mobility started to fail because it would’ve helped a lot in his geriatric years. It’s SUCH a good reminder to work on this again with Coop. Thanks for that!! This was a fascinating read. I think any kind of activity or training can improve the relationship between animal and human. We had agility tests at our local show which gives this post added interest. We also have seen cats doing agility – its a great bonding process. Well done. Fab post! I’ve been wanting to do agility with my miniature schnauzer for a while now. She’s a smart cookie and think she’d love the challenge. You’re so right! Impulse control is super important and my Loki is also a nightmare for jumping up on people when they have treats. Very interesting! 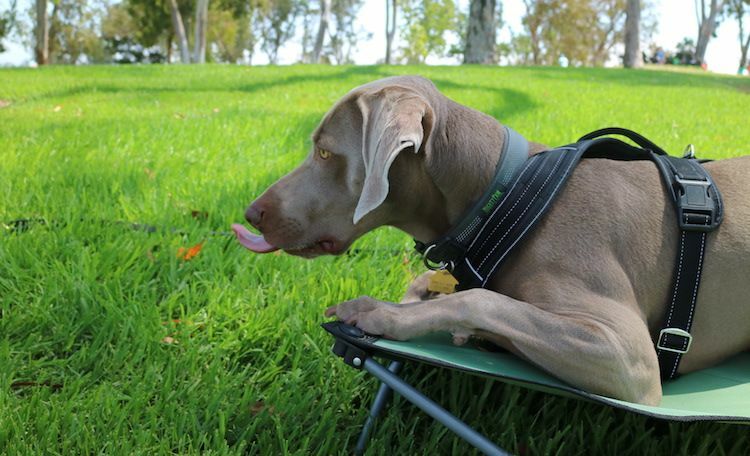 This is the second blog post I’ve read this weekend about back end training for dogs. I had no idea what this meant, but your post explained it for me. This is fascinating. There is a lot of teamwork involved with owner and dog working as a team so ensure the right signals get the right interpretation. Don’t anyone ever tell dog owners that agility and training are easy, it takes Two! Great post. My Dexter has 3 titles: CGC and two trick dog titles from the AKC. I found it helped us bond early on and I love that I can rely on him when things happen in life. It gives dogs confidence, too. Really great info! I have to laugh because my Jake is such a goofball and has no concept of his “back end”… which is hilarious but not so helpful for training or agility. Unfortunately Jake will never be the type of dog who could excel at agility. I only wish I had gotten my Charlie more involved in this at a younger age when she would have really shined!